We had a nice Christmas dinner with our friend George and his people yesterday. But beforehand, I took a neighbor for a walk around the house to see the drywall progress. The back bedroom was pretty much done, as was the hall, including the laundry closet. The bay window bedroom was also done, including the ceiling and the boxed out area where the duct from the kitchen comes up. 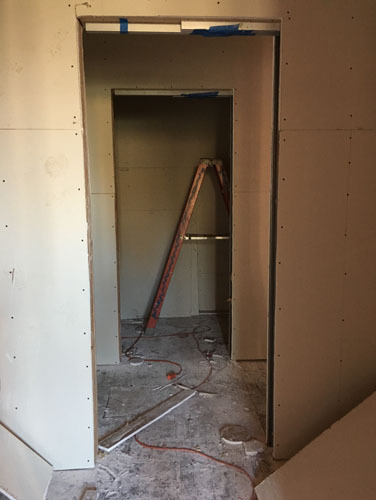 They'd even gotten most of the pantry drywall done, which means they will be done with the easy part of the drywalling -- where the walls need just big flat boards -- in the next day or two. Then on to the more complicated parts where they are matching the existing plaster walls. It's interesting to see how that make it go so fast: the surfaces are painstakingly prepared before they start work, so the studs had been shimmed level, all the weird little nails were removed or hammered flat, and there was no surface prep left to be done. 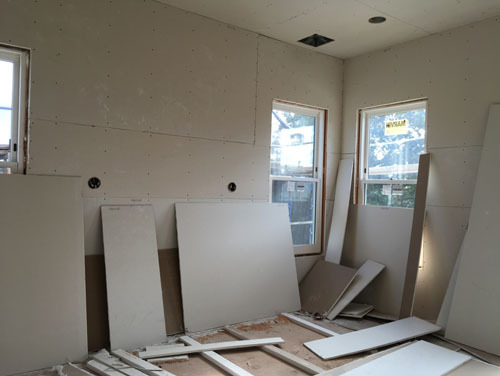 They would then take the largest sheet of drywall they could (4' x 12') and stick it in place, and while it was in place they would cut out the various holes needed with a quick little cutter. For doors and windows they literally just board over the opening then cut it out. 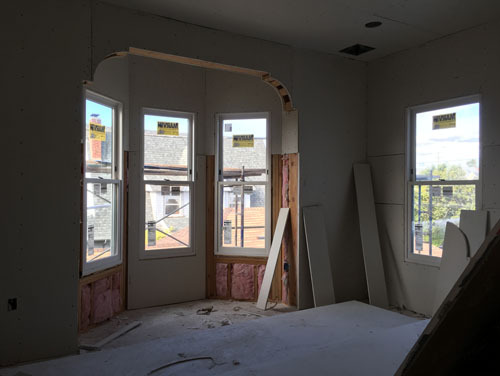 It's not as meticulous as our process, but a lot faster, and you can make the argument that there's no extra added value to being so precious about cutting and placing your drywall. The roof is insulated with spray foam, which is pretty much the best way to insulate the underside of a roof in this configuration. The code requires an R-30 roof, and to get that with fiberglass would be a 16-inch thick roof structure. With foam you get R-5 per inch, so all we needed was six inches of foam and we were good. Plus it seals up better, doesn't sag as much, and doesn't make you itchy like mad if you touch it accidentally. 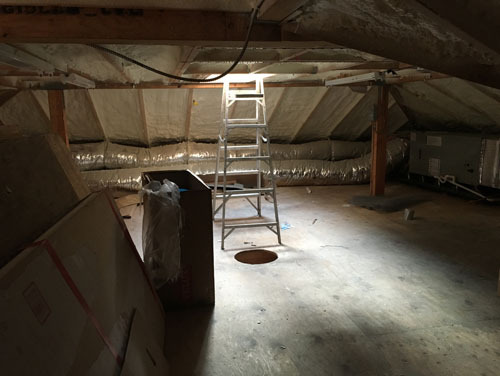 I expect we will put some kind of covering over the ceilings in the attic eventually, just to protect the insulation, but this way we don't need to do that right away.